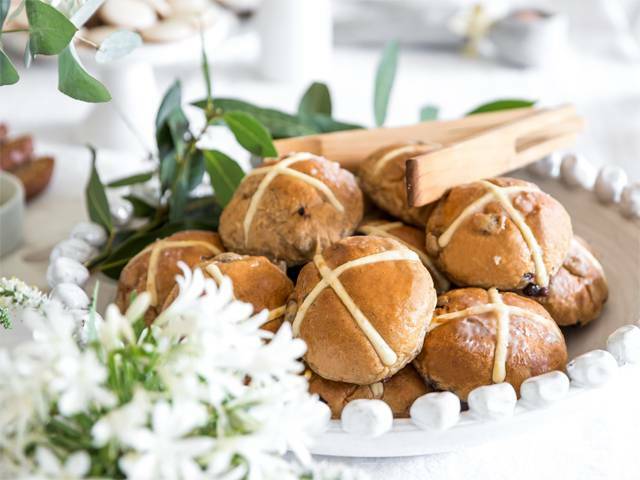 Leading artisan bakery Phillippa's has launched an unrivalled offering of mouth-watering Easter treats including hot cross buns with organic vine fruit and a range of delectable Easter biscuits. Enjoy your Easter treats gourmet style with delicious, aromatic hot cross buns, spicy caramel flavoured gingerbread, vanilla infused cocoa biscuits and Australian honey and cinnamon bunny tail biscuits to name a few. Established by renowned bakery founder Phillippa Grogan in 1994, Phillippa's is synonymous with the best quality natural ingredients and timeless family recipes keeping alive the time-honoured arts of pastry, bread and preserve-making, always with the emphasis on great flavour. Phillippa's hot cross buns have just hit stores and online! A chewy, moist, pert and aromatic bun made with organic vine-fruit, Phillippa's hot cross buns are baked with fresh spices and house made candied peel from oranges sourced at the farmers' market. Like Phillippa's famous bread, the hot cross buns are made with minimal yeast and use a slow fermentation process leaving them to ripen in their own time. This slow, natural proofing creates a distinctive taste and texture and allows remarkably complex flavours to develop from very simple ingredients. A distinctive feature of Phillippa's hot cross buns is the absence of added gluten, malt or ascorbic acid, common to most commercially made baked breads and buns. Phillippa's range of Easter biscuits are mouth-wateringly delicious. A traditional festive biscuit with a spicy caramel flavour, Phillippa's Gingerbread Eggs are finished with a tangy lemon icing and decorated with natural plant-based colours. FUN FACT: Gingerbread first appeared in Europe in the 11th century when monks began selling it at fairs. Made with exotic spices it was considered a luxury and was sold to celebrate festive occasions. Phillippa's Easter treats are available instore at Armadale, Brighton and Richmond, online at www.phillippas.com.au and select grocers and stores nationally. Hot cross buns are delivered free to Melbourne's CBD, Docklands, Richmond and East Melbourne with a minimum order of 6 boxes.